I don't know about you, but even if I have the latest portable web search gadget with me on a trip, I prefer to have a guide to possibilities in old-fashioned paper form. Whether you're like me and work your travel plans around an arboretum or like to find out where the closest public gardens are to your destination, The Visitor's Guide to American Gardens should definitely be along for the ride. Put this book on your gift list for yourself or a fellow gardener. It's the latest, greatly-illustrated glimpse into the best gardens to visit in the U.S. plus Canada. At just $19.99, it's the perfect gift exchange item for travelers and gardeners as well as garden travelers like me. Author Jo Ellen Sharp has done a great job packing it all into a portable paperback that will make you want to get on the road. Not meant to be a detailed account of what you'll see at each garden, the book hits the highlights with succinct descriptions of the not-to-be-missed at each place. But if details are sought while you're in the car, most of the listings include a QR code that, when scanned with your smart phone's camera, takes you to the facility's website where you can get all the latest information. As nerdy as I am about visiting public gardens, I of course counted up the ones I'd enjoyed over the years. (I think it's close to 60.) In early June, Nichols Arboretum is not to be missed for its lush, historical peony garden. 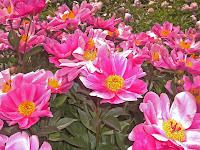 Come to northwest Indiana for the Porter County Master Gardeners Gardening Show January 21, 2012 for the story behind the peony garden and how it's being renovated. David Michener, Associate Curator, University of Michigan, and Arboretum Horticulturist Carmen Leskoviansky will present a program on the rehabilitation of North America's largest collection of heirloom peonies. Two I haven't had much luck locating are 'Duchess of Portland' and 'L'Etincelante'. So it's happened once again: I've turned to talk of peonies. But if you visit Nichols during peony bloom days, look for the middle-aged woman salivating and making sudden moves as she tries to soak it all in.